Harvest Gold Memories: Atari Celebrates 40th Anniversary!?! The end of June 2012 was the 40th anniversary of Atari Corp., a company that brought home video gaming to the masses back in the late 1970s, and arguably ruled the space until competition emerged in the 1980s. In fact, I upgraded to a Colecovision at one point, but the point is not lost that Atari really brought that stuff into people's homes. They were really the company to do it. 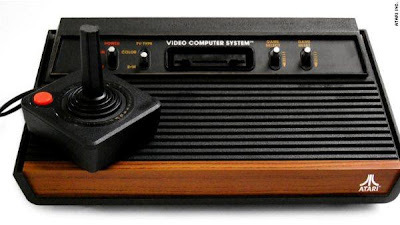 I can remember the elation of opening the Atari Video Computer System or VCS (which later became known as the Atari 2600) one Christmas morning. That was, by my recollection, perhaps the coolest Christmas gift I remember. That was MY Red Ryder BB Gun (that reference comes from the 80s holiday classic "A Christmas Story", which I actually saw in my local theater back in the day)!! Sure, we probably got better gifts along the way, including a VCR (what's that? well, in the analog broadcasting days, it was a recording device that let you record TV shows for the first time ... ever ... although they became better known for enabling people to rent movies and watch those from their living rooms). Today, DVRs do the same basic thing, but remember, in those days, you pretty much had to plan your TV viewing schedule around broadcasters' schedules, or you missed out. The VCR changed that paradigm. The big downside of the VCR is that early versions practically required a PhD degree to program recordings! Still, by my recollection, the Atari was a much cooler gift! My memories of Atari 2600 are still quite fond, although now that 40 years have gone by, it seems very rudimentary by comparison. Even my original Sony Playstation, which blows anything the 2600 could do away, is a dinosaur. And home PCs enable all that, and more. However, I expect that trend of planned obsolescence of home video games will continue. Today's Wii or PS3 or XBox whatever iteration will be history before too long, too. Although a home version of Pacman was the epitome of geeky coolness back in the day (in fact, my readers may note that I even include Pacman and his ghosts into the design of this blog), even if Atari did a lousy job with it ... the company redeemed itself somewhat with Ms. Pacman which was much better (although nowadays, any smartphone has the original Pacman and/or Ms. Pacman available, complete with intermissions), and newer video game systems enable live competition with real competitors located across the country via the internet, but the notion of the time-sucking home video games was revolutionary back in those days. You may note that I have a link in the right margin under "Links I Like" Called "[Atari] 2600 Online" (see http://www.2600online.com/ for that), where you can pretty much play most Atari 2600 emulator games online, including those from third-party developers like Activision. There's another cool site called Atari Museum [http://www.atarimuseum.com/] which has lots of background info. people with an interest might like to check out. Atari Age [http://www.atariage.com/] which actually was a loyalty program/magazine sponsored by Atari back in the day, also has even more stuff you can check out, including the original game owners manuals! Although Activision's Pitfall! was IMHO the best game ever made for Atari, that company (Activision) still closely guards even the original and has since launched newer versions of that classic game. Anyway, in recognition of the original time-sucker known as Atari 2600, I dedicate today's post! Author P.S., January 21, 2013: The Associated Press reported that Atari's U.S. operations filed for Chapter 11 bankruptcy protection in an effort to separate from it's French parent company. France's Infogrames Entertainment first took a stake in Atari in 2000, but it acquired the remaining stake in 2008 and changed the whole company's name to Atari. Atari SA said it filed for bankruptcy protection in Paris and New York after it failed to find a successor to main shareholder and sole lender BlueBay as it wrestled with tough market conditions. Having said that, in recent years, Atari's U.S. operations have shifted to focus on digital games and licensing, including developing mobile games, and it had become a growth engine for the parent company, to the point of being much better-performing than the rest of the company. In fiscal 2012, digital and licensing revenue both grew significantly and contributed 70% of revenue, while sales in bricks-and-mortar stores declined. In a statement, Atari said the move was necessary to secure investments it needs to continue growing in mobile and digital gaming.